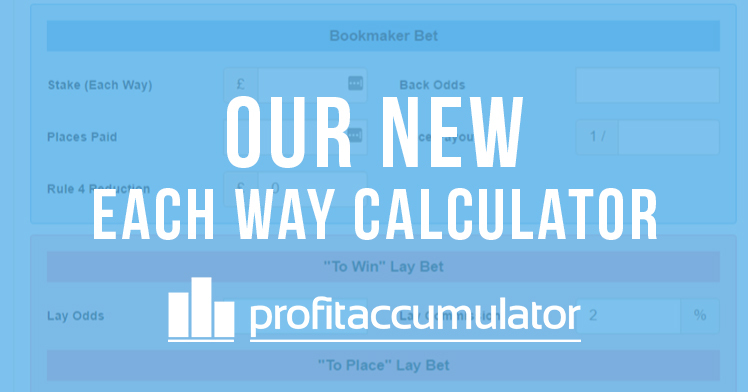 Say hello to our new Each Way Betting Calculator! 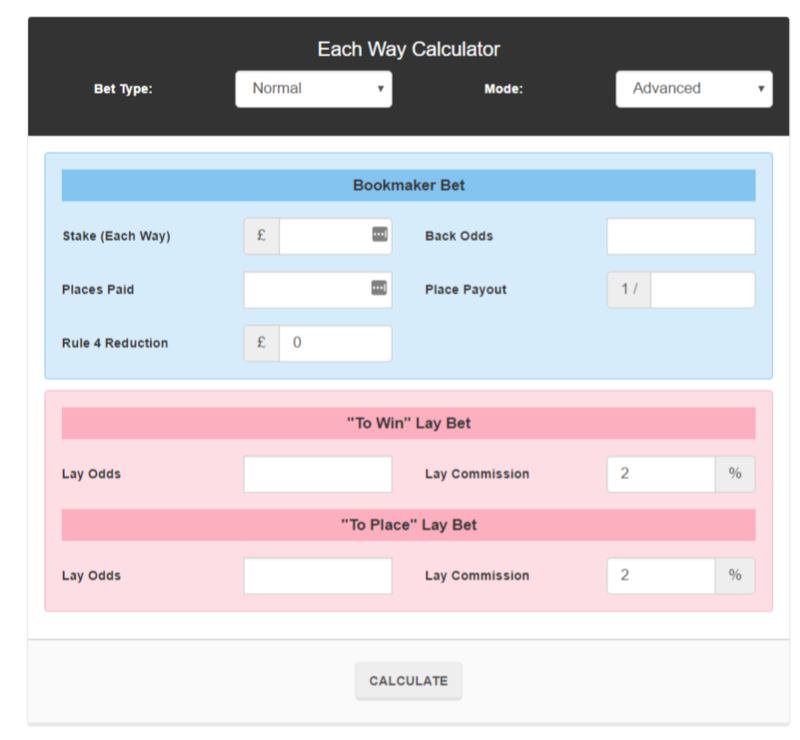 Designed to allow you to calculate your lay stakes for each way bets. Whether it be qualifying bets or free bets. 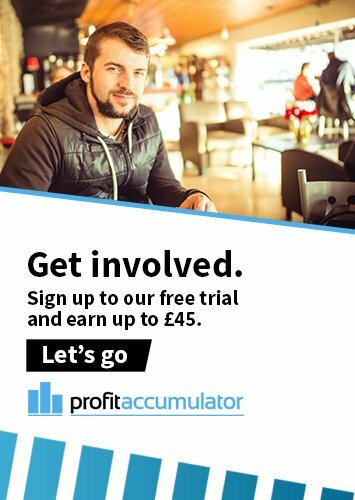 The idea came from one of our inhouse Matched Betting Wizard's Mark, then helpfully coded by our Developer Ben, for all of our members to reap the benefits of! An each way bet is two bets rolled into one. The first bet is betting on the horse to win and the second bet is on the horse to place. If the horse wins then you win both bets, if the horse finishes in the place positions then your place bet wins and your win bet loses. If it fails to finish in the place positions then both of your bets lose. That's the back bet part of it. How do we turn it into a Matched Bet? By laying both the bet to win and the bet to place, you remove the losing factor and reduce it to a qualifying loss on both bets. Which is what we want. How does the New Each Way Calculator work? The calculator will work out the lay stakes for both parts of the bets and combine all possible outcomes into one figure at the end. This makes it a rather powerful tool indeed. Essentially, it's two calculators rolled into one. 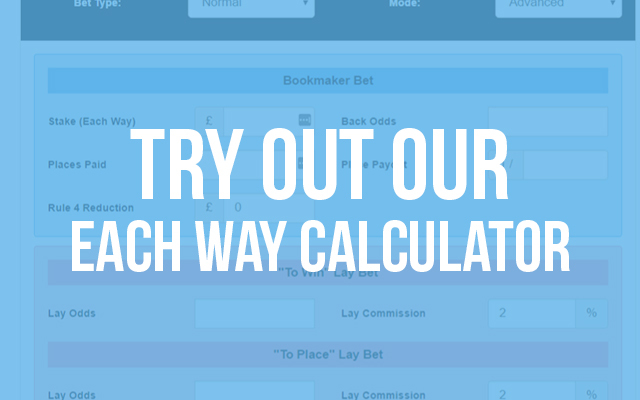 The Each Way Calculator is designed to save time and effort. No longer will you have to manually calculate stakes for Each Way bets, or have to have two calculators open and running. It can all be handled effortlessly in the Each Way Calculator. It also accounts for the price that bookmakers are paying out at. So, for example, if a bookmaker is paying out at 1/4, it will work out 25% of the odds behind the scenes and will do the same for any other payout odds. The calculator also has a Rule 4 reduction cell that will massively help you calculate your new back odds. Just enter the amount of reduction the bookmaker is taking and it will recalculate the odds for you, then you can continue on with laying your bet with the adjustments. What sets our new Each Way Calculator apart from our competitors is the free bet SNR mode. This allows you to place your free bets on Each Way bets and still qualify for extra places. Another upshot of that is it looks like a very good mug bet to the bookmakers. We've found that you can get more than the usual 80% from a free bet by doing this.